Cleveland, OH (December 14, 2010) —The Greater Cleveland Automobile Dealers’ Association (GCADA) has named a new board of directors for 2011. The announcement was made by Louis A. Vitantonio, Jr., President of the GCADA, at the organization’s 44th Annual Reception. As a part of the new board for 2011, Bill Burke of the Spitzer Auto Group, steps down as 2010 Chairman of the GCADA and becomes Chairman of the 2011 Cleveland Auto Show. 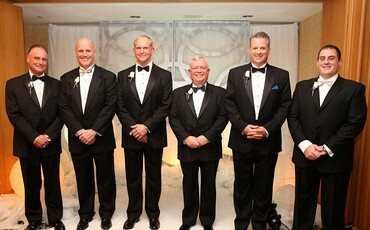 Brian O’Donnell, of the Valley Auto Group, becomes the new Chairman of the GCADA for 2011. Vitantonio, who was named President of the GCADA in 2010 and has served with the organization for 14 years, will continue to serve as President. “As a dealer recently told me, there is a reason why the windshield of a car is 50 times larger than the rearview mirror,” Vitantonio said. “It’s about looking forward to what’s ahead and not looking back. The members of the Association have found a way to persevere through the many challenges we have faced in the past year. And many of those issues are in the rearview mirror. But there is more work that needs to be done. Daniel Sanders of the Progressive Auto Group becomes 1st Vice Chairman, while Ed Babcock of Junction Auto Sales steps up from Treasurer to 2nd Vice Chairman. Colin MacLean of Elyria Hyundai, the board’s newest member, has been named Treasurer. The Greater Cleveland Automobile Dealers' Association (GCADA) has served the retail-automobile industry and community with integrity and distinction since 1903. Today, located in Brecksville, Ohio, GCADA represents 240 franchised motor vehicle dealers, which includes new-car, truck, motorcycle and RV dealers in a 21-county region of northern Ohio along the Lake Erie shore and beyond. More information on the GCADA can be found at www.gcada.org.